It was under a banyan tree where the Buddha felt his calling to a new level of enlightenment. Under these same trees, Gujarati businessmen hold their meetings. Recently in Malaysia, the state assembly met underneath the welcome atmosphere of the banyan tree. It’s a far cry from the typical meeting boardroom–but might we be better off there? There are many images that come to mind when we think of Asia, from dragons to beautiful beaches, spanning varied cultures. One of my favorite views is that of the banyan tree, for it must be strongly grounded in the earth, which also allows its larger branches and leaves to provide overreaching shade. It was under a banyan tree where the Buddha felt his calling to a new level of enlightenment. Under these same trees, Gujarati businessmen hold their meetings. It is even used as a place for political meetings: Recently in Malaysia, the state assembly met underneath the welcome atmosphere of the banyan tree. So for much of Asia, spirituality, entrepreneurship, and politics are taking place outdoors. 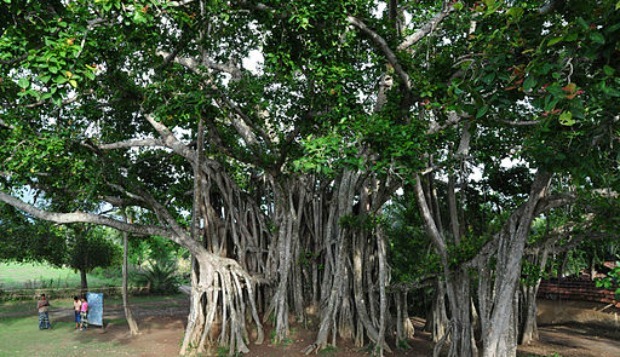 The banyan tree represents solidity, rootedness, and strength. At the same time, it also represents comfort, shade, and welcome. It is a source of power, balanced with peace. It represents firmness, as well as welcome. Is America’s Banyan Tree the Conference Room? Yet what if we looked at doing all of our business, or even holding all of our meetings, under a banyan tree (or even outdoors during lunch, or someplace closer to nature that lets inspiration and conversation flow more freely)? Perhaps this atmosphere would allow us to be more authentic. If we are surrounded by nature’s occasional stirring winds, visionary clouds floating across the sky, and brilliant beckoning sun, would we not also settle into a more authentic course of conversation? Could it lead to more natural, comfortable (and no less impactful, but rather more so) solutions? Within this reframing context of nature, we can discuss our goals and hopes and plans and perhaps achieve even greater goals. Here’s a thought: We can replace the pen, paper, and busy scribbling of notes with more eye contact. We supplant the flurried white board scrawls with more thoughtful listening. What a profound impact this has to have on any business relationship, business decision, and especially, with any personal matter. Until we “unconference room” our meeting spaces, perhaps we can at the very least imagine all of our conversations thoughtfully taking place under a Banyan tree: a place where comfort, understanding, and right relationships result under its strong, rooted, and peaceful presence.